Who needs a buy-sell agreement? Entering a business partnership is something like a marriage. While it’s not often preceded by romance, starting a company is a largely financial arrangement where partners share benefits and risks. In the event one partner is unable or unwilling to continue with the business, a buy sell agreement sets out how that partner’s interest is transferred. In that way, a buy-sell agreement is much like a prenuptial agreement signed by couples before marriage. Even if your business is small and new, a buy sell agreement is an essential legal document. It protects all partners and provides certainty in the event an unexpected crisis necessitates a change in leadership. A buy-sell agreement, also called a buyout agreement, sets the terms of a partner’s exit from the business. It determines how a co-owner’s shares are sold, including who can buy them and at what price. Often, buy-sell agreements are drafted with funding provisions, such as an insurance policy, to pay for a buyout. Certain provisions might limit the personal risk held by each partner and shift it to the business entity. In an entity purcahse arrangement the company is put in the position to buy the departing owners shares. Generally, the company will take out a life insurance policy on the life of each of the owners to help fund the entity purchase buy-sell. In a cross purchase arrangement, the remaining owners agree to purchase the departing owners shares or interest. It is imperative that the that the owners negotiate a predetermined price or system for determining a price at the trigger date. As its name states, a hybrid by sell agreement is a mix between an entity purchase and a cross purchase. In a hybrid buy sell agreement, the remaining owners and the business are required to purchase all of the shares or interest of the departing owner. Without a buy-sell agreement, certain triggering events can put the business in jeopardy. If an owner leaves unexpectedly, passes away or becomes incapacitated, remaining owners may be in conflict with family members over share ownership. An agreement can also set the conditions of a share sale, preventing departing owners from selling their interests to a competing company. These kinds of clauses ensure the remaining owners are protected from activity that does not benefit them or the company. In the absence of a buy-sell agreement, if there is not enough money to buy the departing owner’s interest, the company might face dissolution or liquidation. The contract typically limits this risk by establishing a funding formula for a buyout. Often, share price is set in the agreement and buyouts are paid for by an insurance policy, but there may also be an installment plan or other structure. These provisions have another potential benefit. By determining the share price, it may be possible to simplify estate tax issues when a partner dies and company shares are passed on to heirs. A buy-sell agreement, therefore, gives owners financial protection for both the owners and the company, and peace of mind that the business will continue without conflict if a partner leaves. Some owners may wish to make unresolved conflict between partners a triggering event of the buy-sell agreement. Like many business contracts, a buy-sell agreement should be tailored to suit the needs of each company. A business lawyer will offer additional insight about the kinds of circumstances that should be addressed in the document. Establishing a buy-sell agreement is an important first step after a business is established. It provides protection against risk as the company’s value grows. 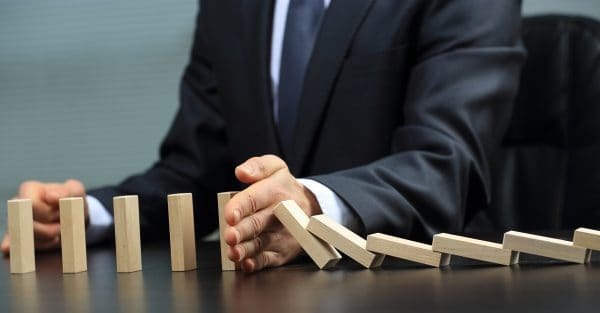 Often, triggering events are unexpected, so the security of a buy-sell agreement can offer certainty in the midst of great change and allow for a smooth transition at the top.